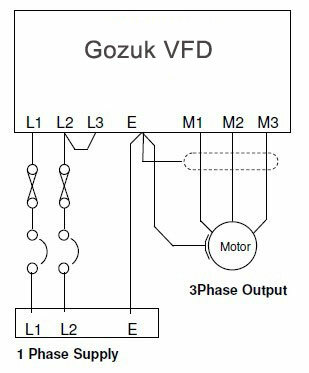 The most common applications of 1hp VFDs are Fans & Pumps, just like larger horsepower VFDs, it changes the power line input of single phase 60Hz/50Hz into variable frequency to feed the 3 phase motor, thus reducing the 3 phase motor speed and electricity consumption. A pressure sensor (connect to the 1 hp VFD) senses the pressure and sends a message to the variable frequency drive. As the demand increases, the pressure sensor will detect the drop in pressure and increase the VFD's frequency in order to increase the motor speed to maintain the pre-set pressure. 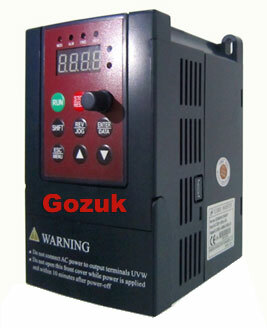 In the case of 380V 3 phase variable frequency drive, multiple pumps can be controlled by a single VFD, the variable frequency drive inter connected to communicate with each other. Therefore, if one smaller pump can not cope with the water demand, the second pump will power on automatically. As the demand decreases, the pumps will shut off one by one which can have significant savings on electricity. The installation of VFD is simple as shown. Speed control can be manually using the controls provided or remote speed potentiometer. A Pressure control system can be easily achieved using the variable frequency drive internal PID control and an external pressure sensor.